Old School Blogging is happening here, folks. Get ready. Do you love it? I love it. It’s so nice to have something easy to write about, because the ideas, people. They are hard to come by sometimes. Oh, you’ve noticed? How nice of you to keep that to yourself. 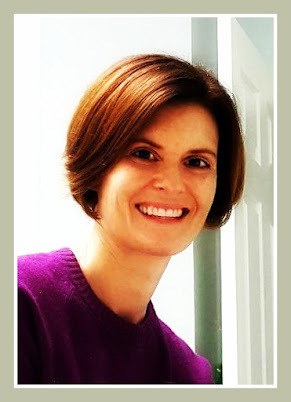 I'm linking up with Elaine of The Miss Elaine-ous Life, who has teamed up with Mindi of Simply Stavish this month to ask a few questions related to everybody’s favorite season: Fall! Okay, Fall really isn’t my favorite season. I like it okay. I mean, it’s fine. The leaves, the gourds, the cooler weather. It’s nice. It’s sort of the lead-in to that time of year where claustrophobia reeeeally takes hold for months and months and my skin dries out like tissue paper and my bones feel like ice cubes. I do love Halloween, though. Let’s talk about Fall, shall we? What Fall traditions do you have? I always put up fall decorations in mid-September. Each year I try to do something fun and unexpected, like hide tiny pumpkins around, or string a garland of leaves around our life-sized cardboard cut-out of Joe Paterno, or put a horrible rubber mask on top of a broomstick and stick it in a different place in the house every day. Then I record my family members’ reactions when they come across it. What a bunch of scaredy-cats. The recipe is pretty easy. If you give me your contact info I will send it to you. What is a favorite Fall photo (or photos) you’ve taken? 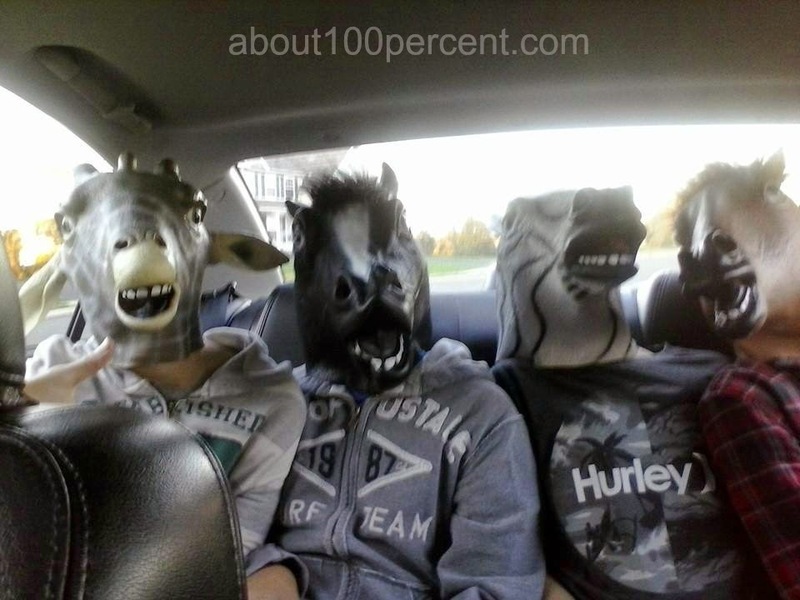 Last year our son and his friends wore those rubber horseheads and I drove them around. Why no, that’s not four children in the back of a sedan. Why do you ask? Okay. One is a giraffe. Football – love it or hate it? Hate is such a strong word. That’s so cute. Multiply hate by infinity and we are approaching how I feel about it. I’ve written about it before here and here. What was your favorite Halloween costume as a kid? In the 6th grade my girlfriends and I dressed up as punk rockers. I got a little too excited and became Emo Goth Girl instead. Incidentally, this photo is a fair prequel to my high school years. Pumpkins or ghosts or both? Pumpkins. You can’t make pie from ghosts. What’s your favorite fall fashion item? In the fall I start wearing jeans, boots, and scarves, and I don’t stop until April, which is also around the time when I start suffocating under all the clothing that must be worn to keep from freezing to death. Is “leaf pile jumping” your thing or not? Leaves are outside, yes? Then, no. It is not my thing. Is “It’s The Great Pumpkin, Charlie Brown” a must-watch at your house? That’s one of those shows that is on at like 8:30 on a Monday night during the first week of October when school starts ramping up and there are a zillion other things going on. I haven’t seen it in years. What are you going to be for Halloween this year? I don’t know. I’ve always wanted to own a tuxedo. Maybe Halloween will be my excuse for finally getting one, and I’ll tell everyone I’m a penguin. Love your answer about the leaves. I like the idea of hiding little bits of fall around. Thanks, Julia! Once as a kid I jumped into a pile of leaves and when I emerged there was a huge slug on my arm. Totally disgusting. That put me off of leaf-jumping forever. It's like we're the same person. Except I like football. Whether or not I like something is pretty much determined by whether you can make pie out of it, too. It's a pretty good gauge of likability, isn't it? You even make Fall funny! :D That is such a PERFECT reason to like pumpkins over ghosts, OMG! And That soup would be fabulous with some rotisserie chicken added in - bought at the grocery store, already cooked, of course! Happy Fall!! Of course! The best chicken is the kind that's been roasted in a stand-up oven with twenty of its friends. Sometimes I approximate soup packet soup with rotisserie chicken, broth, a few carrot shreds, fine egg noodles, and a couple of spoonfuls of salt. Just because we love it so much. I look forward to your posts more than my People magazine subscription. You can get them on ebay for about twenty dollars. Be sure to order them way ahead of when you need them because you will forget that you ordered them by the time they arrive. And me over People? I'm flattered. Because Sexiest Man Alive. haha! Can you please give me the details on that soup recipe??? I need it. Also, the giraffe head. Where can I get one? Boil water. Dump in packet. Cook and stir for five minutes. Pour into bowl. Add four or five ice cubes because BOILING WATER. I'm not sure of the giraffe head - ours was the zebra. Try ebay, maybe? I think I'm going to be the Queen of Hearts. Cady is going as Alice and James as the Mad Hatter. I'm going to glue a heart to a white t-shirt and make myself a crown. Done. Boom. I like your Halloween style. Plus who can pass up any opportunity to wear a crown? I LOVE Halloween, and it's my favorite holiday! I haven't decided what to dress up as this year, but I must say that punk rock girl is my favorite. Followed by Hair Band Girl. PS we are Halloween twins. It's my favorite holiday second only to Easter. When should I expect that packet of soup, er, I mean recipe, in my mail box? I'm cracking up! Love your sense of humor. We're not football people either. Not even a little bit. That soup looks delish. Pinning! You won't be sorry about the soup. It really is good! I wish none of the people in my house were football people. It's amazing how much time, food, drink, and space one football person hogs up when the game is on. This is terrific. We clearly have similar loves/hates about fall. 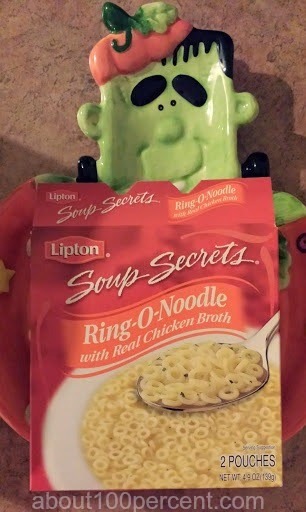 Ring-O-Noodle was one of my two favorite soups as a kid. I remember there being a cartoon character king or jester or somebody on the box - do you know who I mean? The other was Chunky Sirloin Burger - those little burgers were so cool. My Dad used to make the Chunky and serve it over buttered egg noodles. Comfort food. I may have to steal this prompt for my Monday post because Soup of the Week didn't happen this week - too much illness in the house for soup. How ironic. Or, wait, I could use the Ring-O-Noodle recipe! Now there's a thought. I hope you used the Ring-O-Noodle recipe! Chunky soup is the best. I ate a ton of it when I was pregnant with our son. Chicken Corn Chowder, yum. I was the pregnant lady at the grocery store buying 10 cans of it every week.